zwlrc.exclusive.deal.llc has no other items for sale. Nice watch. Just as noted in the auction. Thanks!! This is such great quality. I was expecting it to be a nice watch because I know the quality of Movado. However, for the price this is so incredible. This seller has great communication and is Most Highly Recommended. My husband loves this watch it is stylish and great especially for the price you pay! One downfall is my husband is a big guy and has a large wrist so we had to add a hole to the band and will be attaching a metal band soon that fits properly, but anyone with a normal sized wrist it will be great for. This is an excellent well know time piece for the price or close to what you might pay for a sport watch. Yet, this is a classic everyday dress watch. This replaces the gold one that my parents had given me years ago that I unfortunately lost. While the face is bigger than other watches I own, I do not have any problems telling time. GF bought the same watch at Macy's for over two & half times the price. Immediately returned it & ordered this one. Couldn't be happier! 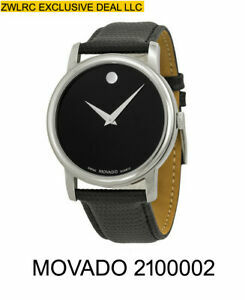 Sweet Light weight, quality 100% legit Movado Museum.